So you’ve decided to look into purchasing a weighted blanket after hearing about their potential benefits? Or maybe you want a bit more information before making that decision? Great to hear! We at SleepForce have made this buying guide to help you figure out what you need to know before making your weighted blanket purchase. To learn more about the science of deep touch stimulation, view our “Do Weighted Blankets Work?” post. Here, we’re going to talk about what you should look for in a weighted blanket to maximize your benefit, such as the best materials, weight, and inner filling material. As covered in our article “What Are Weighted Blankets”, most weighted blankets are multi-layered, with an inner weighted layer, and a removable machine washable outer layer. The inner weighted layer is stitched in an extremely tight pattern, and filled with weighted materials. The first weighted blankets had such materials as rice and grains, though more modern blankets offer either poly-pellets, or in the case of the SleepForce Blanket tiny glass bead pellets instead. The fillings used are important for how long they last, how well the filling stays in place, and most importantly for how effectively they create deep touch pressure stimulation — with denser materials creating a more impactful swaddling effect. Not all weighted blankets found online offer an outer layer, and they may not let you know you should have one. We advise the use of an outer layer because it provides comfort, protection, and ease of cleaning. Outer layers material range from cotton, similar to sheets and duvet covers, to Minky fiber, a synthetic fiber which is extremely soft. A good weighted blanket will come with a well made outer layer which has attaching clasps for the inner layer to connect to. A bad weighted blanket will not have the attaching clasps, which results in the weighted layer bundling up to one side of the outer layer while you are laying down, negativing the desired effects of the weighted blanket. What Weight Should It Be? While covered in greater depth with our “How Heavy Should a Weighted Blanket Be?” article, the general rules are as follows. The best weight for your blanket depends somewhat on the inner filling material — we designed our weighted blanket to evenly distribute the inner weight better. This means when you are laying down the weight will be over your body, not rolling off onto your bed. So, in our case, we recommend that adults use a blanket between 15 and 20 pounds (or about 10% of their body weight) to create effective deep touch pressure stimulation. 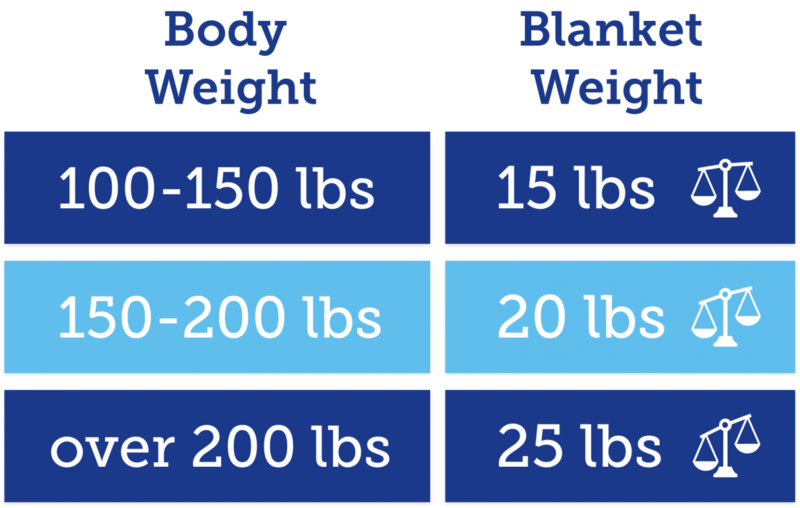 The amount of weight needed may be more if you purchase a weighted blanket which uses a less concentrated filling agent. What Fabric Should I Pick? This, in fact, is a question with two layers: inner and outer fabrics each have their own effects on a blanket and can make the blanket either well regulated for heat and moisture or a bit stuffy, scratchy, and uncomfortable. SleepForce typically recommends an inner layer of cotton (our inner layer is 100% cottom) as this is the best in terms of bead retainment, strength, moisture and temperature regulation, all at an excellent price, where the other appropriate inner fabric would be something like silk which is a fantastic fabric, but incredibly expensive. As for the outer layer, there are many options available such as cotton and Minky (similar in softness to mink fur, but cruelty and animal-free made from synthetic fibers). WARNING: The cheapest weighted blankets available online don’t come with an outer washable layer and those companies may not make it obvious before you buy that you will want a protective, soft, and machine washable outer layer. 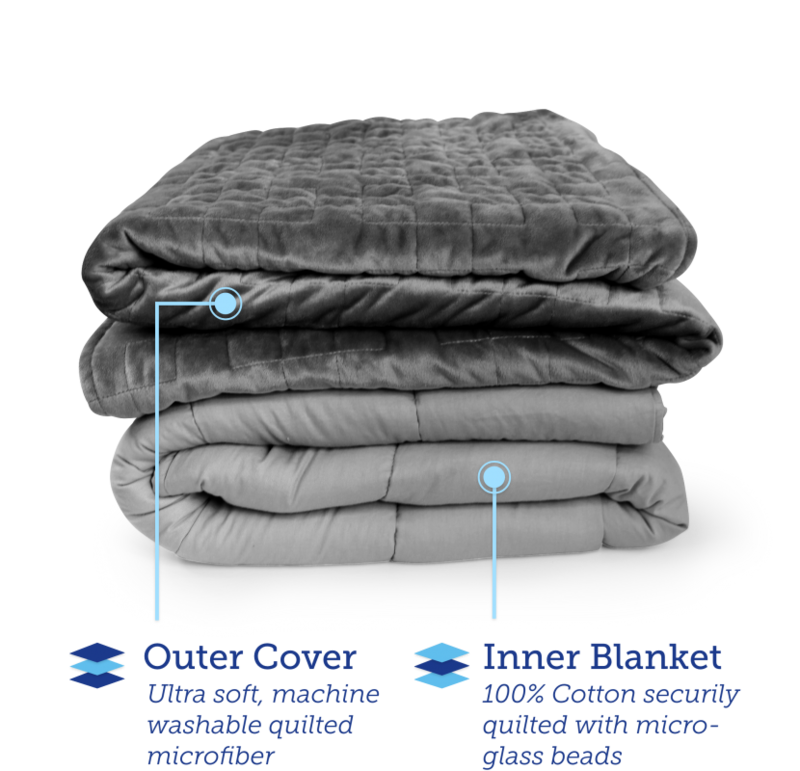 SleepForce blankets are made with quilted Minky fiber. It is fully machine washable and soft as a cloud. After testing several options for our blankets, it was obvious to us that Minky was the best fabric to use. Unlike many blankets, you don’t necessarily want a blanket that goes over the edges of your bed if you’re going to be using it as a sleeping blanket, which is why you will rarely if ever find blanket sizes in the “full, twin, queen or king” size charts, but instead with inch measurements. Of these, the standard size is 48 inches by 72 inches, which provides optimum length and wrap potential for most people. As with most products, being assured that your purchase was a good one is paramount. Look to make sure the company you are dealing with has a 100% money back guarantee, as the fact of the matter is not every product works perfectly for everyone. Likewise, as mentioned in some of our articles previously, not all individuals who look into a weighted blanket may find it as useful as they like. Outside of the blanket, be sure to check if the company you are buying from offers any extras to help with a restful nights sleep. 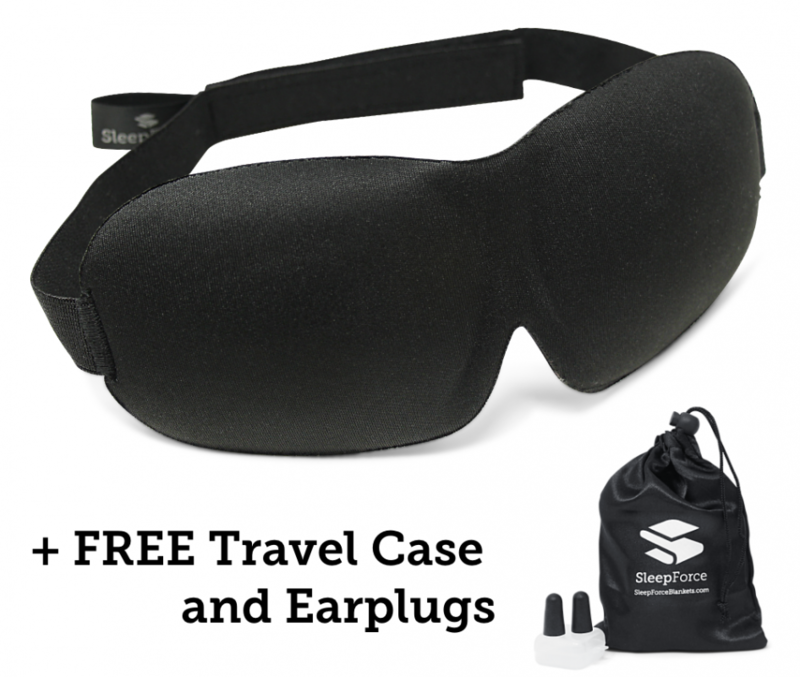 SleepForce currently offers a memory foam padded and contoured sleep eye cover, ear plugs and a small carrying bag to reap the most benefits from your purchase. All in all, when it comes to buying a weighted blanket, you need three things: quality, comfort, and assurance. With SleepForce, you can get all three at a very affordable price.